La casona de Tía Victoria is a XVI Century Building, that was rebuilt in the early 1900s, and now totally reformed to meet new comfort standards while remaining its original architecture in Decembre 2010. In the center of the Ville of Rueda, in the heart of Castilla & León, one of the largest amount of Monuments worldwide, with the Duero River close to the house and in the middle of an area with more than 350 winaries. Perfect to Visit Spain with your family or friends. In less than 2-3 hours you can reach all the main Monumental Cities or you can enjoy the 'Campos de Castilla (Fields of Castilla)' and its nature in less than 2 minutes. The Rural House can host up to 22 people, in 5 big rooms. Has a Dining Room for 30 people and a big patio with barbacue where you can enjoy and relax. Wine: There are more than 60 Winaries under the Denominación de Origen Rueda You can visit 14 Winaries of those. 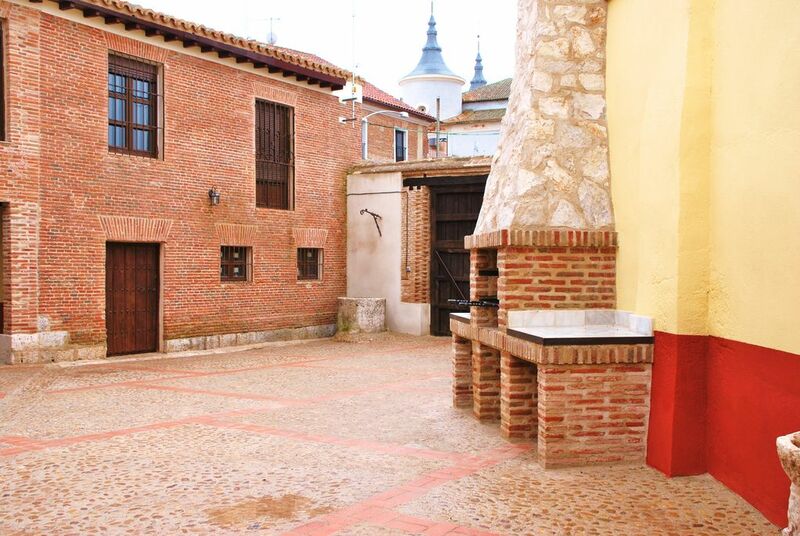 House Pick: Without Leaving Rueda you can visit 'El hilo de Ariadna'. A different way to visit Yllera Winaries. In Medina del Campo you can find the Castle de la Mota, one of the Largests castles of Castilla y León. Reserving 2/3 hours to visit is highly recommended. In Tordesillas syou can find one of the Royal Monuments, the Monastry of Santa Clara. An XIV centiry building with a mudejar style church insude. Is one of the most important monument to visit. Castilla y León is one of the few regions in Spain that has Royal Monuments among the thousands of Monuments inside its terrotory. Nature: Rueda is a perfect place to enjoy the Natural environment. Here you can find easy walks or bike rides just from the door of the house. Two hour walking or 50' biking at low pace. Smooth hills on the way, and you will be among vineyards, cereal fields, and parallel to the river during 1 km. When you reach the small Roman bridge is time to turn left and go back. One hour biking or 2h 50' walking. The road to La Seca allows a high view of all the landscapes and the way back goes close to a small valley among smooth hills. Even we are in the plainest province of Spain take care when biking uphill and downhill. We are maitaining the tradition of our family thru the conservation of the house of our Aunt Victoria (Tia Victoria). Tha family has been stablished in Rueda since the XVth Century and this is the place we love. You will be in the middle of the largest amount of art in less than 3h drive and in one of the largest collection of vineyards with more than 350 in less than 1h drive. Be comfortable in a place with more of 500 years of history is an unique experience. Feel the frredom of innumerable choices for adults and children. The town itself is full of hitorical houses and buildings. Public Pool 3 minutes away from the house walking. Great rural location and excellent service! We wanted to find a quite and relaxed place where we could enjoy a weekend, and we found this great villa that you can rent for short periods of time. We really enjoyed our stay there. There was 10 of us, 4 couples and 2 children, and there was plenty of room for us and many more people. The house is completely re-conditioned so it is very comfortable and has got a full equipped kitchen. It was a pleasure to spend the weekend there. We did some guided tours of local vineyards and were able to taste the "verdejo" wine, unique from the region. We will definitely come back and would highly recommend the stay. We had a great time during our stay at "Casona de Tia Victoria" in Rueda. There was 10 of us, 4 couples and 2 children, and we wanted to have a relaxed long-weekend in the area. The villa consists of a completely refurbished house with fully-equipped kitchen and all the facilities we needed. It was very comfortable, and we loved our stay there. We did some guided tours of the local vineyards, and we loved the "verdejo" white wine, unique from that region. Easy access to surrounding towns made our life easier, and from Rueda we did visit Segovia and Valladolid, together with smaller places that had great interest and very good food as well. We will highly recommend the visit and we will definitely come back for another visit, as there were plenty of things to do and see. Rates are calculated for groups of 10 People.